This quite ambitious 12 year series of outstanding quality bullion coins was given the name "the Shēngxiào Collection", and is a tribute to the Chinese calendar and zodiac circle, as well as to millennia of Oriental history and myth. Interestingly, the British Lunar series are of the same .999 silver fineness and as the Britannia and the Lunar coins share many other characteristics, you shouldn’t be surprised if they are referred to as Britannia Lunar coins. As all UK legal tender coins the Lunar UK Series is also Capital Gains Tax free. 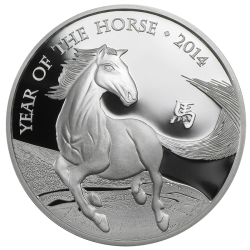 Produced by the Royal Mint, the UK Silver Lunar Series celebrate Chinese traditions of the Lunar Calendar. It is custom to wish good fortune to friends and family each year by offering gifts, and the Lunar UK series represent the perfect symbolic gesture. Struck with the Royal Mint’s finest silver, the one ounce coins boast a 99.9% purity and are manufactured to the highest standards. Silver Lunar UK coins are available for purchase on the CoinInvest website. Purchasing bullion from our online store couldn’t be easier. All you have to do is click on your selection to take you into the product page. From there you can add Lunar UK coins to your basket and either proceed to check-out or continuing browsing our online store. The Royal Mint’s UK Lunar series is the latest addition to the British Mint’s line of products, and the British version of Lunar Chinese Zodiac bullion coins. It aims to add an exclusively British point of view to the Chinese New Year custom of exchanging gifts connected with the Chinese zodiac circle and its tradition. With the innovative Silver UK Lunar series, the Royal Mint aspires to attract and be popular with progressive investors, but, most of all, catch the hearts of insightful collectors, particularly the ones intrigued by customs and traditions of this mystifying country of the Far East. Silver UK Chinese zodiac coins are the perfect gifts to wish good luck and fortune to those who receive them. The subject matter of a collector coin design is an element of crucial importance. The Chinese have been minting commemorative zodiac New Year coins since 1981, but the real competition - or threat if you will - for the UK Lunars comes from the Land Down Under. The Australian Perth Mint’s Lunar I & Lunar Series 2 are extremely popular amongst investors and collectors since 1996, the first year of their release, and not without a reason. So what where the Royal Mint people thinking? The coins are to be designed by British-born Chinese artist Wuon-Gean Ho who was commissioned to create the first coin of the series for the Year of the Horse and go on to complete a series of 12 coins, embodying a contemporary British twist to the traditional Chinese theme. The style of work this truly gifted artist has adopted (cleverly promoted with videos on the Royal Mint site) may be incredibly labour intensive, using multiple designs and long forgotten by other mints engraving tools and methods, but is so true to the traditional spirit of making coins that the end result can only be conceived as part of a myth. On the obverse side we find an exquisite effigy of Queen Elizabeth II engraved by the Royal Mint’s chief engraver Ian-Rank Broadley, and encircled by the legend "ELIZABETH II DEI GRA REGINA FID DEF", meaning "Elizabeth II, by the Grace of God, Queen-Defender of the Faith". Combining parts from both Chinese and British tradition, the 2014 design depicts a mighty galloping stallion, symbolizing the characters of those born in the Year of the Horse: extrovert, charming, and dependable. Under the horse’s hoofs we see the figure of the Uffington Horse, an ancient white horse carved into the chalk hills of Oxfordshire. For the Year of the Sheep (2015) the artist has created a charming design picturing two sheep coming from the Yorkshire valley of Swaledale in England, combining both countries' heritage again. The artist has captured the spirit of belonging by picturing two sheep, though also projecting the ancient Celtic method for counting the herd. People born in the Year of the Sheep are not overly fond of sudden changes or impulsive decisions, but also has the patience to allow anyone with them to enjoy an unhindered ride over life's ups and downs. Visible on the coin is the year of issue in numbers as well as the Chinese name, along with the coins’ weight and purity. Through a millennium of minting experience the Royal Mint has always been committed to updating its manufacturing techniques with the latest technology developments and stands worthy of its reputation as a world leader of producing coins of the highest standards, being at the same time innovative, progressive and true to traditional values. In the case of UK Lunar coins the thoroughness of the engraving is just as important, but thanks to the best possible choice of an artist and the Royal Mint’s exquisite finish, the silver coins lavishly glow in perfect definition. The enchanting traditional red wrapping is certainly a great plus! The Royal Mint has always taken counterfeiting seriously and quality control, together with security features are mandatory. UK Lunar series coins are produced to the highest standards matching precise standards specified by law, which can be easily confirmed by experienced dealers. It also takes a trained eye to appreciate the unique style and brilliance of British Lunar coin designs, fundamentals that a forger would be simply incapable of achieving. For investors, collectors, or plainly people who want to enter the precious metals market by purchasing some of the most fascinating bullion coins available, the Silver UK Lunar series is an excellent option offering artistic, collective, and numismatic value as well as an exotic presentation, all with the prestigious safety seal of the British Mint. CoinInvest is always keen to hear from visitors with collectible coins for sale like the Silver Lunar UK series. As leading precious metal bullion product dealers, we are always interested in acquiring bullion products of high rarity and silver Lunar coins are always a pleasure to receive. We offer competitive rates based on current the current spot price, so if you are looking to cash in on your assets, please do not hesitate to contact a member of our staff.